[By Nick, discontinued / out of business] After my more than positive experience with Clemmy’s Vanilla Bean pint, I thought I would give one of their novelty bars a try. I love fudge bars so when I saw these in the store I knew what I would be trying them next. Now I bought this box for $2.50 on sale and there are only 4 bars in the box. Now that’s fine because of the sale but the normal price was around $5 which would make the bars over $1 each. That seems a bit overpriced if you ask me. 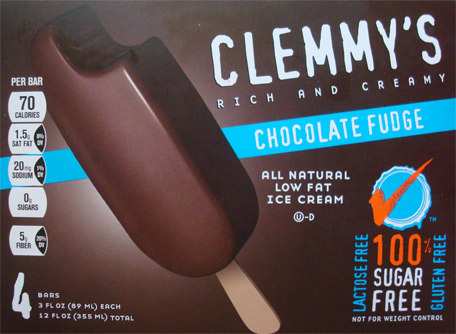 Clemmy’s describes this one as having the same taste as their chocolate ice cream but on a bar for a more convenient snack. This will be like killing two birds with one stone then since I won’t have to try their chocolate ice cream now. Also like all of their ice cream, these are sugar-free, lactose-free and gluten-free but not hyphen-free (there’s my terrible joke for the day). Another thing to note is that each bar only has 70 calories which is just mind blowing to me. I mean this thing is 62 grams, so there is close to the same amount of calories as there are grams in this one. Out of the package and minus a few ice crystals, it looks exactly like your typical fudge bar. The looks translates to the taste because it is also tastes exactly like a fudge bar. There’s a nice cocoa flavor to it that's not too milky. I’m not going to delve into how it tastes exactly because I would hope the majority of you know what a fudge bar tastes like. The only difference I could find was in the texture in that it was not so creamy as it was dry. I’m not sure if that’s the best way to put it but it just wasn’t as smooth as I was expecting, especially after trying the vanilla bean. Still for a sugar-free option it’s not bad at all.